Is there really a right way to declutter? Search on Pinterest and you will find hundreds of ‘how to’ guides telling you the right way to declutter pretty much anything. Unfortunately, I wasn’t wise enough to know such things existed when I started minimising. This could explain why it took me so very long to un-do all the mess that I had made and to simplify our belongings. I’m glad in a way now though that I took it slow, as it meant that I got to try out lots of different decluttering styles, some of which were definitely more enjoyable than others. I’m not one for telling someone how to do something but below is a list of five differing styles that I used during my decluttering process and my thoughts on them - from how productive they were, to how they made me feel. I find that decluttering can be emotional, even if its not sentimental items and so I thought it would be nice to give some advice on how they worked for me. Simplifying is really hard but it’s fun (now that its over) for me to reminisce on that part of my minimalist ‘journey.’ Hindsight is a wonderful thing isn’t it? I would never have guessed at the time, how fondly I would look back on the physical efforts of simplifying, but I really do and I promise you that it’s worth it. These are good times, that with time and dedication, will bring you closer to living a better life with less. I’ve got to say that this is not a blogpost on decluttering the children’s things, that is a whole other/much longer post, which is definitely waiting to be written. I have so much to say on children and minimalism but for now this is more of a declutter around the house post. It was where I started and there was enough to keep me busy without worrying about the children’s things. Our house contained So. Much. Stuff. I actually quiver a little when I think of how many things there were to declutter and I honestly feel like superwoman when I think back to how determined I was and how much I minimised over that time. Anyway, I hope that this encourages you to either start tentatively, or to just go for it. Either way, you will have started and that is possibly, the hardest part of all. The ‘throw away the rubbish’ method. This is quite self explanatory, a great and easy way to start decluttering, if not rather boring and time consuming. Basically just go around the house and throw away, (recycling wherever you can), the rubbish. All of those age old leaflets lying around the kitchen, all of the broken or out of date batteries/pens/knick knacks/household items. Without much thought and effort they are gone. It is such an easy way to gain momentum and it really is crazy how much rubbish you actually have in your home, once you start looking for it. The ‘daily swoop’ method. 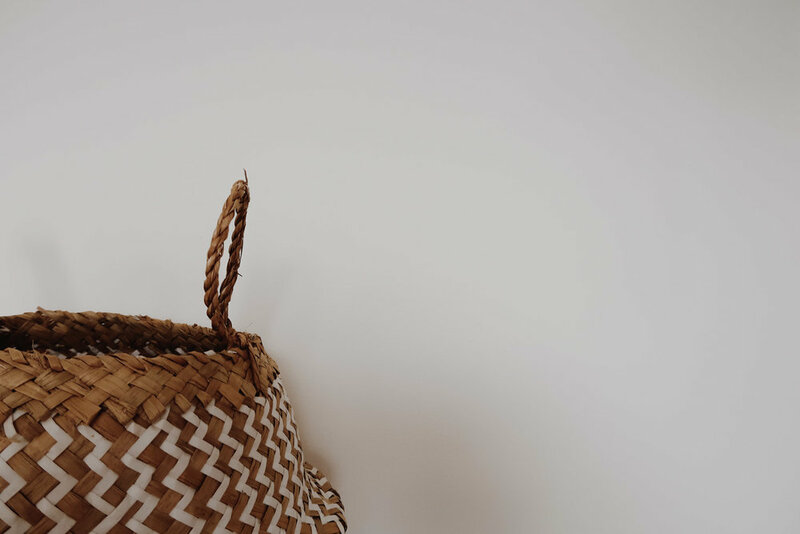 Keep an empty basket/bag in the room that you are currently decluttering, I much preferred a pretty basket but my love for baskets is another story! Each day swoop up the things that you notice you no longer use or need. This is great if you are limited on time, as it is literally just a pick and grab into a specific space, which can take as little as five minutes at a time throughout the day. Just remember to sort out said basket at the end of the week, into bin/donate or sell piles. Otherwise you will still have the clutter, it will just have been moved to a different spot. This is something that I’ve kept up and still do regularly as it’s such an easy way to bundle everything together in one place to go through. The ‘surface’ method. Clear all surfaces that shouldn’t have things on them. In our home that included the kitchen worktops, windowsills, the top of bookcases, bedside tables and that chair that acts as a walk in wardrobe, everyone has one of those I’m sure. Either put items that you want to keep in their designated space or declutter the things that you don’t need anymore, such as artwork, books and those spare clothes that just get moved from place to place because you don’t want to make a decision about them. This is a really helpful way to get a feel for how you house could look living with less. Clear surfaces make all the difference and as someone who only use to use surfaces for throwing stuff on, I couldn’t imagine living that way now. My mind feels so much clearer just from this method and not only that it takes so much less time to dust, which lets face it, is worth it for that alone. The ‘Hold It’ method. This is not one for the faint hearted but it gets the quickest results. Make sure that you have some time set aside, 30 minutes, an hour or however much time you can allow. Put on some music or a motivating podcast (a podcast about minimalism is extra wonderful) and pick up the first item you see. Turn it over in you hand and look at it. Don’t just look at it, really look at it! Do you love it? is it useful? and would you buy it again today if you picked it up in a shop? If the answer is no, you know what to do. It’s funny until you try this method, how little we actually think about the things in our home. All that time that we spend cleaning, dusting, tidying and tripping up over items that don’t get thought about, even though they are taking up so much of our personal space and time. That gifted frame that you hate so much but put up with out of obligation, or the sale cushion that is the wrong shade of grey but you went ahead and brought it anyway. So many things in our home are kept because we don’t put any real thought into what we let inhabit our space. This method generally needs to be done a dozen times in any one room because as you get use to simplifying, each time around you generally want to get rid of more. I certainly found that on the first declutter I only got rid of a handful of items, thinking that I couldn’t live without something. However the more I learnt and the more I sat in a space - really thinking about my possessions, the more I was able to let go. This is possibly the most well known way of decluttering, thanks to Marie Kondo’s ‘Spark Joy’ and although I haven’t properly read her books (I know! and I call myself a minimalist) I really liked this method for getting me to think intentionally about the items in my home and I still use it when decluttering and shopping for things that I need. The ‘put back what you love’ method. I’ve saved the best till last as this really is my very favourite method of all and let me tell you why. When people talk of minimalism the first initial thought is often of sacrifice. What am I going to have to give up to be a minimalist and how am I going to make my house a home with no stuff. By turning it around and focusing on what you want to keep makes decluttering so much more meaningful and fun! Unfortunately, I didn't come to this method until quite late but it definitely left the biggest impact. For me this came about when I was getting the carpets refitted in my home (another bonus of selling all my stuff, meant that I finally had the money to change something that I had hated for so long) I obviously had to empty the whole house full of stuff and even though this was a year into simplifying, there were still many things that I hadn’t got rid of but probably should have let go. The trouble was that after a year of minimising and making decisions, I had become quite stagnant and if I’m honest, lacked the motivation to remove any more stuff. However when faced with an empty room, I wondered why I would ever go to the trouble of putting items back in that didn’t really belong. We had used the opportunity of new carpets to paint the once coloured walls brilliant white and much of our possessions just didn’t feel right anymore. And so I had the idea to only put back in the things that I really loved, the things that made my heart sing or/and had sentimental value. It was a really happy, joyful process. If I had my chance again I would have used this method more, I think it would have spurred me on to keep going when I didn’t feel like I could. The hard part with this came from learning to live with the white space when I had been so used to living in a riot of colour. It was hard emotionally, to process this space and physical echo without wanting to rush and fill it all up again. I will write more about this because it was such a powerful reaction to simplifying but that aside, this was the point when only having what I loved made complete and utter sense. It was perhaps my pivotal moment in feeling the true freedom of minimalism. My once cluttered house now only held items that we used and loved. Despite the bubbling feelings around empty rooms and wondering what on earth I’d done, I knew that this was meant to be. It just felt right. This had been our home for 11 years and it had never felt as peaceful as it did that day. A calmness washed over me that I can’t really explain but I still feel it when I step inside my home and it has never lost that feeling of new beginnings. Can we get something straight? You don’t have to go to the extreme of re-doing your carpets or moving house to get everything out of a room to minimise. However if truth be told, I’m not sure that I would have been motivated enough at this point to get rid of the excess, without that final push. I would encourage anyone though, to turn decluttering on its head and focus on the things that you want to keep because they make you happy, rather than focusing on the things that you have to get rid of to be a minimalist. I promise you that it will feel amazing to be surrounded by the things that you love, the things that you chose to put back in.